We are counted as a leading manufacturer, supplier and exporter of Vacuum Dryer. 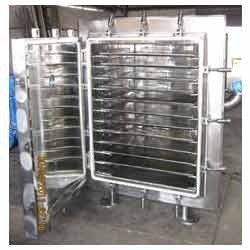 These products are generally used for drying high-grade temperature & oxygen sensitive products. Our range is highly suitable for hygroscopic substance, which is dried to very low residual moisture, content level. Moreover, our range is the sole possibility for drying lumpy, glutinous products or products of low pomposity. Backed by rich industry experience of 18 years, established in the year 1992, we, "Quality Instruments and Equipments" proved ourselves as a renowned manufacturer, supplier and exporter of Pharmaceutical and Laboratory Equipments. Our range comprises a wide range of Cashew Equipment, Labratory Equipment. These products are highly appreciated for their unique features like high durability, longer functional life and cost effectiveness. We use high quality material obtained from trusted market vendors to manufacture our complete range. Our products are widely used in various hospitals, research centres, pharmaceutical industries, automobile industries, educational institutions and various other industries for different applications. Further, we hold specialization in manufacturing these products as per the specifications provided by our clients. The complete range is fabricated using sophisticated technology and advance machinery. We have garnered a reputed client base namely Emcure Pharmaceuticals Ltd., Alkem laboratories ltd, . and many more other brand names. We export our products to Dubai and Africa. Moreover, our team members are continuously involved in manufacturing the finest quality products that meet the international standards of quality. The quality experts of our organization thoroughly check the complete product line to ensure that no flaws are left. We have set up an advanced manufacturing unit for production of our range. Furthermore, we make sure that each product is manufactured in such a manner that the specific needs of our clients are fulfilled. Owing to the quality approaches and client centric approaches, we have established a huge clientele all over the Indian Subcontinent.